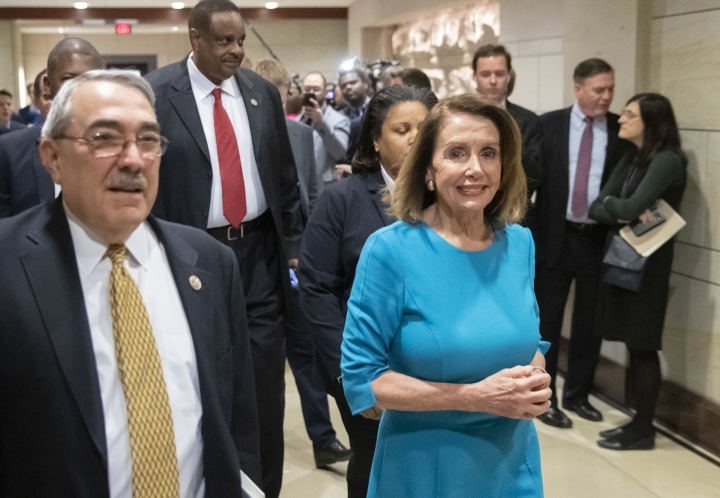 Pelosi entered the closed-door caucus election in an unusual position -- running unopposed despite the clamor by some Democrats for new leadership. Votes were still being counted, but she was assured of victory. "Are there dissenters? Yes," the California Democrat told reporters as voting was underway. "But I expect to have a powerful vote going forward." Pelosi was nominated as her party's choice for speaker by Rep. Joe Kennedy of Massachusetts, with no fewer than eight colleagues set to second the choice, including Rep. John Lewis of Georgia, the civil rights leader, and three newly elected lawmakers. As House Democrats met in private in the Capitol, they faced a simple "yes" or "no" choice on the ballots. A sign of the party's mood emerged early as the House Democrats elected Rep. Hakeem Jeffries of New York as caucus chairman, elevating the charismatic 48-year-old from the Congressional Black Caucus as a new generation of leaders pushes to the forefront. The majority, though, went to Jeffries who used his speech to remind Democrats of their core accomplishments -- from passage of the Civil Rights Act to the Affordable Care Act -- before pivoting to his vision for the future. "I'm focused on standing up for everyone -- white, black, Latino, Asian, Native American -- every single American deserves us, here in the United States Congress to work, Democrats and Republicans, on their behalf to make their life better," he said afterward. "We all agree that history is in a hurry, and we need to accelerate the pace of change in Congress," she wrote, noting the "historic" class of new first-term lawmakers, the largest since Watergate, who led Democrats to the majority in the midterm election. "My responsibility is to recognize the myriad of talent and tools at our disposal to take us in to the future by showcasing the idealism, intellect and imagination of our caucus," she wrote. Pelosi's opponents had pledged to usher in a new era for Democrats. But one by one, the powerful California congresswoman picked off the would-be challengers and smoothed skeptics. In the end, there was no one willing, or able, to mount a serious campaign against her bid to reclaim the speaker's job, which she held from 2007 to 2011, before the GOP took back the majority. Pelosi still lacks the vote tally she'll need in January, when the new Congress convenes, to ascend to the post. But "the only person that declared their intentions, spoke to me about their vision and asked me for my vote is Nancy Pelosi." But she'll need 218 votes in January, half the full 435-seat House, which is harder, if all Republicans vote against her, as is likely — though she could win with fewer votes if some lawmakers are absent or vote present. Rep. Kurt Schrader, D-Ore., played down the significance of Wednesday's caucus vote and said the true fight for House speaker will occur in January. But Pelosi's ability to stand unopposed Wednesday, despite the threats from within and reams of attack ads against her, showed the staying power of her brand of machine politics. 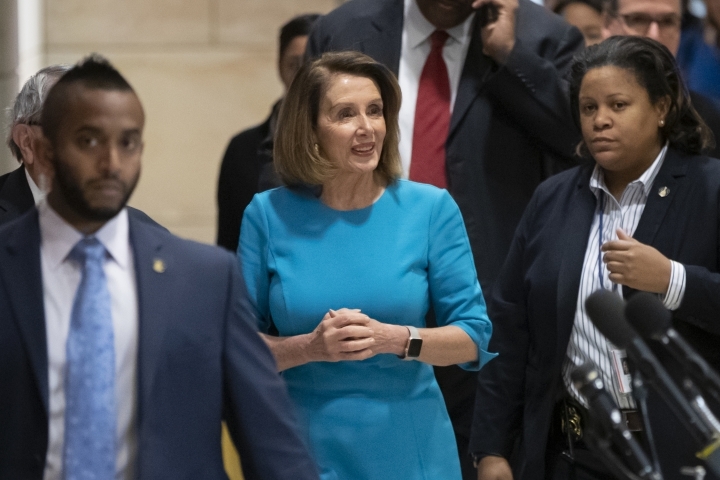 "The reality is there is no alternative," said Rep. Brian Higgins, D-N.Y., who had signed on to the letter opposing her but reversed course after Pelosi tapped him to lead his effort to expand Medicare options to those age 50 to 65.